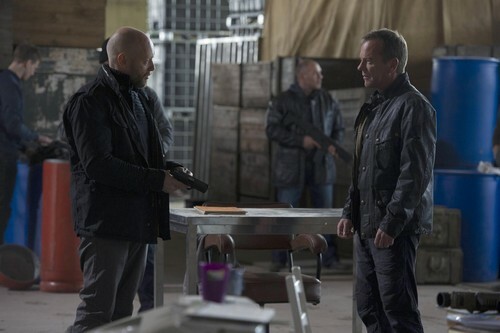 24: Live Another Day airs tonight with a new episode called, “Day 9: 5:00 PM-6:00 PM.” On tonight’s episode President Heller tries to stop Margot from going through with any further attacks, while Jack and Kate race to save the life of a key player in the terror plot, and Jordan is ordered into the field on a perilous mission. On last week’s episode, as the smoke cleared after the devastating events of the first five hours, tensions between President Heller and Prime Minister Davies boiled over, and one of them decided to take matters into his own hands. In the meantime, Jack proposed a plan to locate Margot by using someone unexpected as his unsuspecting bait. Back at the CIA in London, Jordan raised suspicions about Kate’s husband. Did you watch last week’s episode? If you missed it we have a full and detailed recap, right here for you. On tonight’s episode, following an intense and deadly shootout, Jack and Kate are in a race against time to save the life of a key player tied to the imminent terror threat. Meanwhile, Jordan Reed is ordered into the field on a perilous mission. Then, after President Heller engages Margot to end her savage attacks, he faces an unthinkable, game-changing decision. It’s 5 pm. EMTs work on Simone in the street. Yasmin stands with her neighbor who comforts her. The bus driver says she was chasing a little girl and indicates Yasmin. The cop comes to talk to her and asks if she knows her. Yasmin says that she killed her mother. They load up a bloody and battered Simone into an ambulance. Kate watches as Rask’s men and MI5 are bagged and tagged at the site of the shooting. Jack takes some car keys from a vehicle and walks over to Belchek and cuts his ties. He tells the MI5 squad leader that he’s with him. Jack says that MI5 should have never have been there messing up his operation. Jack asks whose orders he’s working under and he says PM Davies. Jack says Davies will be hearing from his President. He next goes to Kate and asks how she is – she asks if it was worth it. Chloe buzzes Jack and says she saw police and paramedics where Simone was hit. Chloe says it doesn’t look good. Chloe gets a message to get out of there and she goes to the window and sees cops coming in. She tells Jack she has to go. Kate and Jack hop in the car to head to the hospital where they’re taking Simone. Mark fills Heller in on the contact information from Margot Al-Harazi that she sent. Mark says that she’s daring him to discuss terms with him. Mark says the video was secured and they can’t use it to track her location. Jack calls Heller and tells him that they have a lead on Simone and that her mom doesn’t know about it yet. Heller says he’ll have her put under guard. Jack asks if he can help him deal with the British police and he says he’ll take care of it. Jack also tells him about MI5’s interference and Heller says that Davies promised him he wouldn’t interfere. Jack says that MI5 lost five men. Davies shows up then and Heller says he has to go. Heller blows up at Davies and says he gave him his word and Davies says that surveillance showed that Jack was betraying him. Heller says he should have never had him under surveillance. Davies says under normal circumstances he wouldn’t doubt his judgment and asks if Heller is withholding information about his health. Davies says if what he’s heard is true, he has his sympathies. Heller says he should have come to him directly and Davies says he’s coming to him now. Heller says if he thought his health was putting anyone at risk, he would resign. Heller says despite Davies SNAFU, Jack still has a line on Margot and asks if he will cooperate. Davies says Jack will have everything he needs. Simone is assessed in the ambulance with likely internal bleeding and multiple fractures. They note the missing finger unrelated to the accident. Simone’s phone rings and the EMT takes the call. He tells her Simone was hit by a bus and says she’s being taken by St Edward’s. He tells her that she needs to get to the hospital and says the police are on the way. Margot tells Ian that Simone has been in an accident and the police are on the way. Ian asks if she took care of Farah and Yasmin first. Margot says to send Kareem to find out how badly she’s hurt and if the police know who she is. It’s 5:10 pm. Back at the CIA location, it’s 5:15 pm and Jordan is running the program Navarro told him not to. He looks around and checks the results. Gavin comes up behind him and asks what he’s doing and says he needs Jordan’s access code. He says he’ll send him the files and won’t give him his code. Gavin is acting odd. Jordan goes back to looking at the program. Navarro gets a call and pops the phone into an encryption device. The call tells him that the analyst is running the data retrieval program even as they speak. He says if the guy sees the partition he created, they will know that he was the one selling the files to China. Navarro is surprised they have access to the CIA systems. Navarro asks if he can send a cleaner to help him out. The other guy is Adrian from Open Cell! He says he’s the middle man and tells Navarro that he’s been well paid so he needs to sort it himself and quickly. Navarro rings off and stares at Jordan at his workstation. Jack and Kate jog into the ER and find a UK cop waiting on them that Davies sent. Her name is Helen and says she’s there to support them. Helen says Simone was chasing Yasmin who said that Simone killed her mother Farah and police found the body to confirm this. Kate goes to talk to Yasmin and Jack goes to talk to the doc working on Simone. He comes out and says she’s unconscious but is coming around. Jack says he has to talk to her before she goes to a CT scan. The doctor says it’s not possible and Jack tells him lives are at risk and that he needs to get her as stable as possible so he can talk to her. Kareem shows up at the hospital and lurks around. He heads into a linen closet and rifles through some hospital uniforms then changes into one. Kate hits a vending machine then goes to see Yasmin who is under guard. She’s being checked over by a nurse who leaves her with Kate. Kate hands her a can of ginger beer and sits beside her. She introduces her and asks if they can talk. Yasmin asks if she’s American and shes tells her she’s sorry about her mom and asks what happened. Yasmin says it was Aunt Simone that did it. She says she was married to her uncle Naveed Shabazz. She says she heard them shouting and her mom say she was going to call the police and shouting at her to get out. She says she came down and saw her mum and blood. Kate rubs her back and comforts her. She asks if Simone said anything. She says Simone told her mum they had to get out of London – she says she was trying to protect her from Simone’s mother Margot. Yasmin says she never met Margot. Kate thanks her for talking to her and Yasmin asks what will happen to Aunt Simone. Yasmin says she hopes she dies. Kate calls Jack and he says they are still trying to wake Simone. Kate tells him that Simone was trying to get Farah and Yasmin to leave London. Kate says they have a great chance to turn her. Kareem lurks nearby then calls Margot. He says he hasn’t seen Simone and says the police are starting to lock the place down. He confirms the police know who Simone is – Kareem says that Yasmin is alive and that an American woman spoke to Yasmin who told her that Simone was trying to get them to leave London to protect her from Margot. She tells Kareem to find out exactly where she is in the building and leave the rest to her. Margot tells Ian to get everyone to pack up. He gives the order. Ian says Margot doesn’t have to do this but Margot says that Simone has already betrayed her once and she won’t let her do it again. She tells her son to move a drone within range of the hospital. He goes to do what she asked. It’s 5:24 pm. At the CIA, Jordan is asked to step into Navarro’s office. He goes in and Navarro is tying up his tie nice and neat. He tells Jordan that he needs him to pick up a dead drop. He asks why and Navarro says they are short handed but to say the word if he’s not up to going out into the field. He says it’s at a houseboat and asks him not to tell anyone about it. Jordan thanks him for trusting him and Navarro says he earned it. We see Davies making an announcement on the news about security measures due to the terror threat. Heller comes in and tells Audrey and Mark that Davies knows about his health and says all of his decisions are going to be second guessed now. He tells Audrey it was arrogant of him to think he could finish his second term. Heller says they need to meet with the VP about a transition once they are back in DC and this is over. Jack looks at Simone’s severed finger and asks if she can hear him. She asks where she is and then about Yasmin. He says that they talked to Yasmin. Simone says she knows him from him tailing her on the tube. Jack says that he wants her to think of all the innocents her mother is putting at risk and he begs her to help him stop it. Simone says her pity for Farah and Yasmin do not mean she would not betray her mother. He says her mother did this and he pokes her severed finger. Simone says her mother loves her and would never harm her. Jack presses it until she passes out. Kate watches but then steps out of the room. Jack follows. He says he shouldn’t have done it but tells Kate that he hates these people and what they’re trying to do. Jack says that Simone wasn’t going to talk anyway. He asks about Yasmin and she says she was traumatized. He spots Kareem and asks Helen who that guy is. He tries to play dumb but then takes some shots at them. They chase after him. He, Helen and Kate split up to pursue him. They find him in the ER and chase him down. One of the cops shoots him as Jack shouts damn it. He’s dead and they see that he texted Simone’s location to Margot and she texted back that he has eight minutes to get out. Jack tells Helen she has to evacuate the hospital. Jack hits the fire alarm and says that Margot is sending a drone to take out Simone. Kate goes running off and says she’ll be back. It’s 5:35 pm. Jack calls Chloe at 5:40 pm. She’s in a pub with her laptop. A drone speeds toward London and Ian tells his mom they have four minutes until they can fire. Jack grabs up Simone and tells her that her mom is targeting her with a drone. She says she wouldn’t do it and he drops her to the floor and says if you honestly believe that you can stay here. She begs him not to leave her. He picks her back up and pulls her along. Kate goes after Yasmin but she’s gone. She can’t find her and calls out for the girl and finds her hiding beside a bed. She says she’ll take care of her and pulls the girl along. Ian tells Margot the hospital is in range. They watch a video feed. Jack drags Simone along and Kate has Yasmin. Patients pour out of the hallways. Margot tells him to zoom in and he sees that they are evacuating. He says that Simone may already be out and Margot tells him to fire anyway. He does. Part of the parking structure goes up in flames. Jack and Kate hand Yasmin off to Helen and Margot tells Ian to scan the area. They spot Simone with Jack and she tells him to fire again. He does and the drone strike barely misses the car. Jack says they have a visual on them and tells the women to hang on. He speeds away. It’s blood, smoke and chaos at the hospital. Simone looks back behind her at the wreckage. Margot tells Ian to stay on them and take the shot when they can. Jack tells Simone that her mom won’t stop and tells her to tell them where Margot is. Jack hustles through traffic as Ian tries to get a bead on him. Jack speeds recklessly and Ian fires again. He takes out the side of a building barely missing them again and curses. Ian says they have to bring it down to 20,000 feet because they are down to their last missile and the other drones aren’t in range. He says they can’t afford to miss again. Jack get stuck in traffic curses and backs up. He says they have to switch cars. They hop out and Kate dags Simone along. He sees a construction mess up ahead. He punches a guy and steals his SUV. They hop in and Ian sees all of this. He can’t get a lock before they speed off, crashing through the street obstruction. He sees a tunnel up ahead and heads for it. They head into it and says they have to switch cars again. A car pulls into the tunnel and Jack pulls his gun and they steal it and decide to head to the CIA station. Jack puts a brick on the gas pedal of the SUV and sends it speeding out of the tunnel. Ian locks the missile on it and blows it up. Margot tells him to look at the footage again and they see from the infrared that it’s empty. They’ve lost Simone. It’s 5:48 pm. At 5:52 pm, Jordan heads out for the dead drop. He walks to the docks and looks for the right vessel. He steps aboard and looks at the padlocked door in confusion. He looks around and then is shot in the shoulder. The shooter comes to check on him and searches for him in the water. He doesn’t see him. Mark sneaks out to meet the Deputy Minister of Russia. The DM tells him that he has to hand over Jack but Mark says the rendition order was signed in haste. The DM says he knows Mark forged the document and about Audrey’s past with Jack. He also says that forging Heller’s signature is treason and Mark says he can’t intimidate him because Jack is out in the field and he can’t get his hands on him if he wanted to. He says once Jack has served his purpose, he can have him. The DM says for his sake, it better be sooner than later and he’ll expect his call. Heller makes a call to Jack. He says he’s seen the event at the hospital. Jack says they are headed to the CIA with Simone and are trying to keep her alive. He asks if there’s a chance to find Margot before the deadline but Jack says they are running out of time. Heller says he needs to see him and that he’ll explain it once he gets there. Jack tells Kate she has to drop him off then take Simone to the CIA. Ron comes in to see Heller with contact information for Margot that he says he got through back channels. He also has the jacket that the President asked for. Heller tells him that Mark is not to know about this. He refuses to tell Clark his plans. Heller dials the number as he changes his jacket. Jack drives. Ian packs. Margot looks at a photo of her daughter sadly. Jordan crawls up out of the water and onto a step in great pain from the wound he sustained. Margot’s phone rings. She takes the call from Heller on a video call. They greet each other with disdain. She says she didn’t think he was man enough to make this call. He says he still has enough time to turn himself over and she says it seems like he has already decided. He asks if he can trust her to keep his word to stop the attack. Margot asks if this is a tactic to buy more time and he says no one else knows he’s making the call. Margot says if that is true then if he surrenders under her terms, no one else will die. She says she’s waiting for his decision and Heller says that his decision has already been made. It’s 5:59 pm.